Get Paid to tell People about Pocket Anatomy! Join the iTunes Affiliate Program! 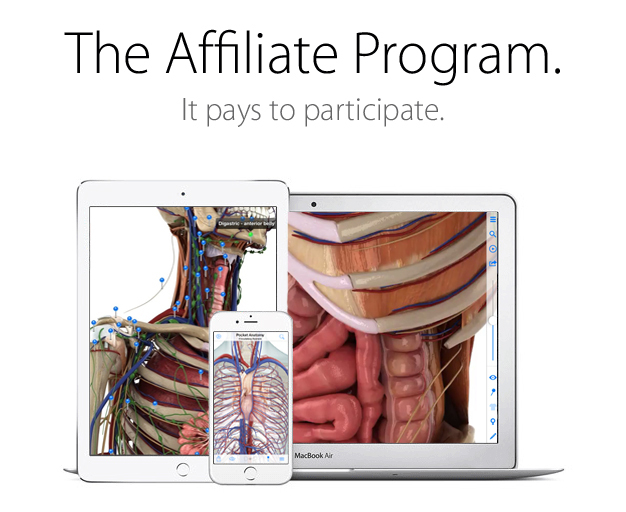 The affiliate program provides a unique way for your website to link to our Pocket Anatomy apps while earning commissions on qualifying sales. Apply now with to join the program and earn a 7% commission from each sale that takes place from someone clicking on your affiliate link. The iTunes Affiliate Program is run for Apple by Performance Horizon Group (PHG). PHG reviews applications within about one week. If approved, you will receive an email with a link to log into the PHG Dashboard where you will find your affiliate token – the key to creating affiliate links. It is worth noting that you must have an active website to be accepted into the iTunes Affiliate Program.